CCaaS stands for ‘contact center as a service’ and is defined by call center software that is hosted (or built natively) in the cloud instead of hosted on-premises. CCaaS providers maintain and develop the software (hence “as a service”), which allows call centers to focus on using the software to provide better customer experiences. The primary purpose of CCaaS software is intelligently routing contacts from all communication channels, sometimes referred to as “skills-based routing”. 15 years ago, contact centers were primarily run with on-premises software systems. This meant that software was downloaded and maintained on in-house computers and servers and required a significant ongoing investment both in people and regular upgrade costs. Legacy providers of on-premises call center software include leaders Avaya, Cisco and Genesys who cornered most of the contact center market until the late 2000s. 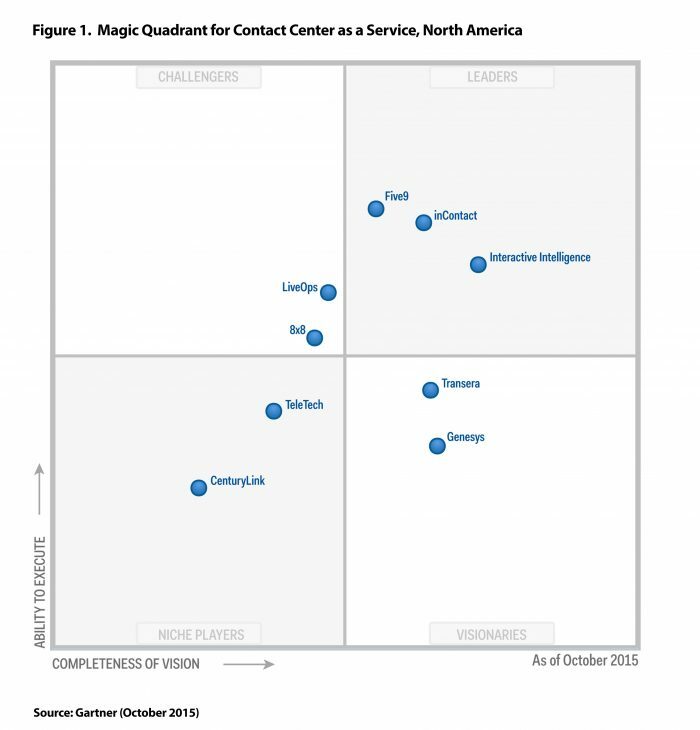 Below you can find Gartner’s 2018 Contact Center Infrastructure Magic Quadrant, which has changed little over the past decade. In the early 2000s, companies such as inContact, Five9, and Interactive Intelligence realized there was a huge opportunity to take traditional call center software and host it in the cloud. Instead of accessing software via specific computers in a call center, agents could now log in to any internet browser and access the same systems. 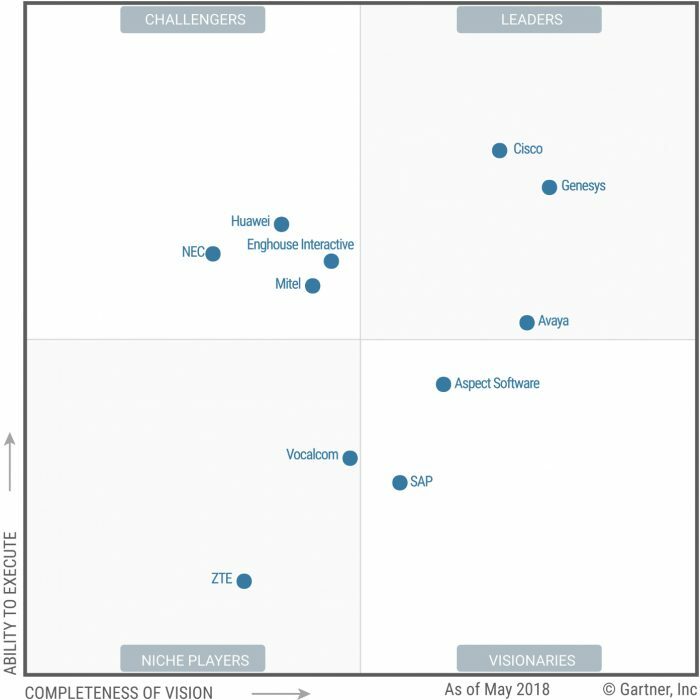 This first wave of CCaaS offerings (see Gartner’s initial evaluation of this nascent market below) included benefits such as lower maintenance costs, the ability to reduce IT headcount, more flexibility for agents who could work from home instead of only in the call center and the ability to scale up and down seamlessly to meet seasonal demand. 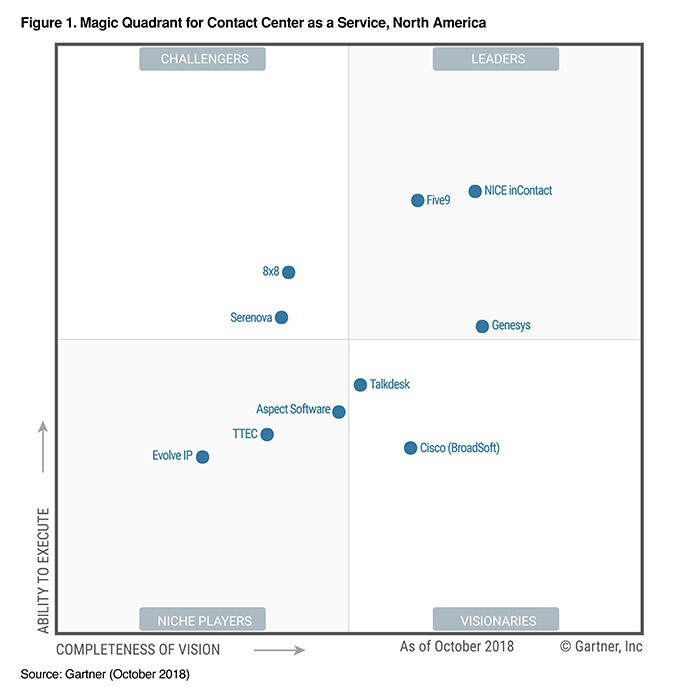 Their disruption of the call center software market worked. In 2016, inContact was purchased by on-premises workforce optimization provider NICE to build a new integrated omnichannel and WFO solution hosted in the cloud. At the time of the acquisition, inContact was generating over $250M in annual revenue with a final purchase price of just over $850M. Legacy contact center provider Genesys also acquired Interactive Intelligence that year for $1.2B, while generating $300M in revenue. Genesys clearly was aiming to help take their on-premises solution to the cloud. 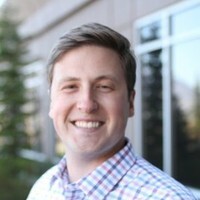 Five9 garnered significant acquisition interest, but ultimately is the only “leader” left who has not been acquired by a legacy on-premises contact center company. Many believe that the Five9 stock is too overvalued for them to be acquired, considering their market cap is now over $2.5B while their revenue is still under $200M. Despite the success of the first wave of CCaaS providers, there were still lingering issues. Their software was built in a transitional time where most code bases were built for on-premises systems and changed to be hosted in a cluster-based environment in the cloud. This resulted in significant downtime events, difficulty integrating with 3rd-party cloud applications and long development and deployment cycles for even the most basic functionality improvements. A single release can take over a month to deploy to all clusters, as this model is following the on-premises logic in a hosted environment. 2) Only 36% of call centers are using cloud technology. i) The legacy CCaaS providers are built on old, antiquated architecture, which limits their ability to guarantee a perfect uptime. ii) These legacy providers have too much technical debt to re-architect their infrastructure to match what Talkdesk has already done. If you’re interested in learning more about why Talkdesk is leading the second wave of CCaaS, get in touch with us today!